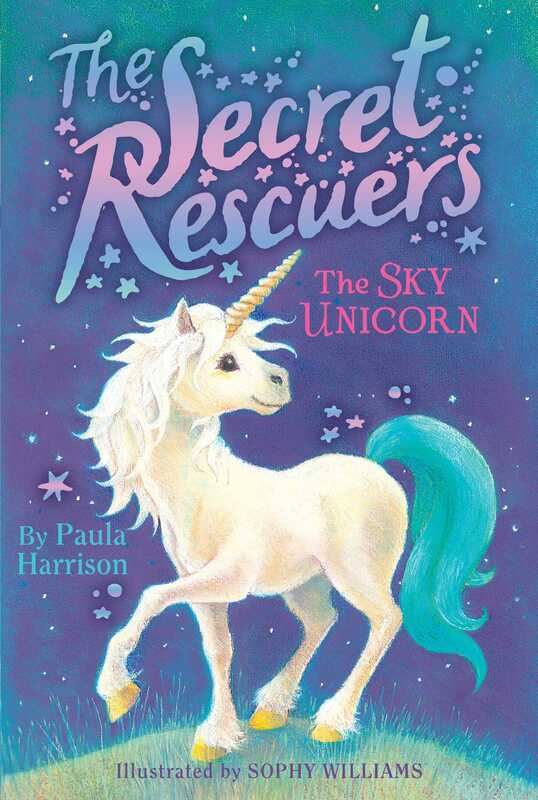 Ava and her friends race to rescue a unicorn in the second book in the adorable, new Secret Rescuers series. Ava is horrified when Clover, a baby unicorn, is stolen from his herd by the evil Sir Fitzroy. She comes up with a secret plan to rescue him, and, wearing a clever disguise, Ava bravely sets off into the night. But will she be able to teach Clover to fly in time to escape? Ava leaned over the side of the boat and let her fingers trail through the cool water. It was wonderful to sail along with the breeze tickling her cheek and ruffling her long black hair. She loved watching the ducks swim and seeing rabbits scampering along the sandy bank. The river ran all the way through the Emerald Plain, and there was so much wildlife to see. Sometimes, if she was really lucky, Ava would catch sight of a magical creature. There were lots of amazing magical animals in the Kingdom of Arramia, such as giant eagles with golden feathers, star wolves that sang, and even sky unicorns! The river sparkled in the sunshine. Two planets, one green and one purple, hung in the cloudless sky. Leaning out a bit farther, Ava watched the six boats following hers down the river. Each one had a large white sail and a cabin painted in bright red, blue, and green. Ava and her family were part of Mr. Inigo’s Amazing Traveling Troupe. They sailed up and down the kingdom’s lakes and rivers, stopping in every town to put on a show. Right now they were on their way to the town of Blyford on the shores of Misty Lake. Ava smiled to herself. She couldn’t wait for the next show. She was going to perform a new dance in the turquoise dress she was wearing. She’d been practicing for weeks! Her dad came out of the cabin and took hold of the main rope to pull in the sail. Then he fetched a small silver trumpet and blew a single note. On the next boat Ava’s three older brothers took down their sail. Then they blew a note on their own silver trumpet. This was how they sent messages down the line of boats. Soon all the sails were in, and the boats slowed down a little. “There’s Misty Lake—just beyond the bridge.” Her dad pointed to a wooden bridge not far downstream. A mass of glittering water lay just beyond it. “I can see it!” Ava made a graceful jump, raising her arms as if they were wings. Then she twirled around. They were moves from her new dance. “Sorry, I forgot!” Ava stopped herself halfway through the spin. The boat sailed around a bend in the river, and a towering hill came into view. Standing at the top was a pale shape that made Ava catch her breath. It was a sky unicorn. As Ava watched, more unicorns trotted over the brow of the hill, their snowy manes flowing in the breeze. With their beautiful white coats, golden horns, and brightly colored tails, they were the most beautiful animals she’d ever seen. Ava felt as if butterflies were dancing inside her. She’d seen sky unicorns before, but never so many together. There must have been at least twenty of them! The tallest one at the front lifted its head, and its golden horn gleamed in the sunlight. Ava had heard stories about how sky unicorns could gallop into the air and race right through the clouds, but she’d never seen them do it. She watched them eagerly, but the magical animals showed no sign of leaving the hill. “Perhaps there’s a foal,” said her mother. “Unicorns will often stay on the ground if there’s a foal, because the little ones can’t fly until they’re older. Now, I’d better help your dad find that rope.” She hurried away. The sky unicorns walked slowly down the hill to the river, close to Ava’s boat. A little foal skipped to the front of the herd, its turquoise tail swishing happily. Then it bent its head to drink from the river. Ava was so excited she could hardly breathe. She’d never seen a unicorn foal before. Its legs were slender, and its soft coat was so white it almost glowed. It raised its head and looked at her with big dark eyes. “Hello, I’m Ava!” she called softly. The foal nodded its head and shook its snowy mane, almost as if it were saying hello back. Just then a man dressed in armor and riding a horse appeared at the top of the hill. Ava guessed at once that he must be a knight. When he saw the unicorns, he shouted at two guards who were hurrying after him. The unicorn foal jumped in fright, and its tail trembled. Ava turned to her parents in alarm, but they’d both disappeared into the cabin. The sky unicorns dashed along the riverbank, scared away by the knight’s fierce shouting. He chased them, urging his horse to go faster. The sky unicorns quickened into a gallop. Racing along the riverbank, they dashed across the wooden bridge that spanned the river. Their hooves made a sound like thunder. The knight urged his horse to go faster, but he couldn’t match their speed. “How dare you!” he yelled. “Come back at once! All magical beasts are to be captured, by royal order.” He called to his men, but they were slowed down by their heavy swords and shields. Ava watched with wide eyes. Why would anyone want to chase a unicorn? The herd had almost reached the end of the bridge now. Soon they would be on the other side of the river. Ava smiled as she watched them gallop so quickly. Then her heart dropped. Quickly she scanned the bridge and the river- bank. The foal had fallen over beside a bramble patch halfway to the bridge. It was trying to stand up again, but its leg was caught by a prickly branch. “Mom, Dad, quick!” Ava called, but her parents didn’t come out of the cabin. The boats behind theirs were hidden by the bend in the river and couldn’t see what was happening. Ava’s heart thumped faster. The knight was riding toward the bridge with his sword in his hand. Any moment now he might notice the baby unicorn. Ava ran to the back of the boat and turned the ship’s wheel so that the boat drifted closer to the bank. Then, as soon as she was sure the water was shallow, she climbed onto the side of the boat and jumped in. Paula Harrison began inventing stories and writing them down as a child, including one about a magical land inhabited by talking bookworms. She lives with her husband and two children in England. Sophy Williams is the illustrator of the Secret Rescuers series. Visit her online at SophyWilliamsIllustrator.com.